Well, you know.... no one has ever traveled to the Oregon coast and taken photos of the light houses before. In that spirit, here are my humble contributions to the genre. Above at Yaquina Head Lighthouse (top) and Heceta Head Lighthouse. Click above to see larger versions at my SmugMug site. Here's the thing. Both of the above are extremely popular tourist destinations and neither are easy to shoot because of the hordes of annoying tourists getting in the way (this is presuming I don't annoy anyone, nor do I get in the way of their crappy photos). 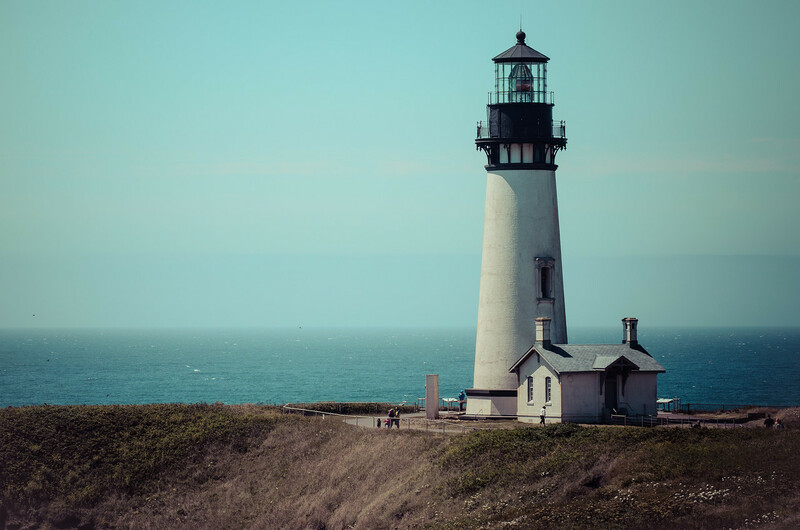 Yaquina Head is a little easier because there's a pathway on the south side of the lighthouse that allows for some angles in which it's possible to not see an RV-stuffed parking lot and sidewalk. Heceta Head is tougher. You can walk the half-mile path to the light house, but then you're right below the thing -- really too close to get any perspective. You'll probably find the best shots are farther away -- the above was taken on a roadside pullout. What I did wrong: I visited both in the middle of the day when the light was bland. The light is probably fantastic early in the morning before too many people show up or very cool when there's a lot of clouds and a good sunset. If I lived nearby, I'd also plan a visit during a storm for more dramatic shots. Also, in the top photo, there's no ocean. I had it in other photos -- here's one that fails to move the wood, so to speak -- but thought the above one best. 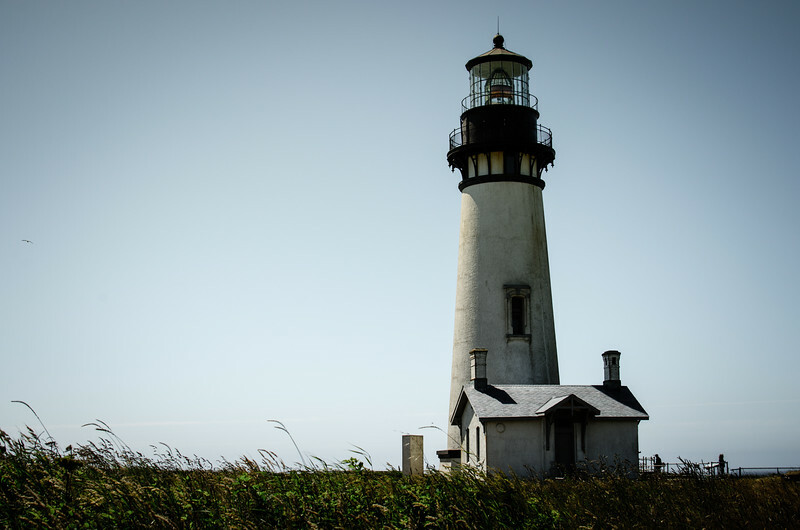 Camera & Settings for Yaquina Lighthouse: Nikon D5100, Nikon DX 35mm 1.8 lens, 1/500th shutter speed, f/8, ISO 100. Shot in RAW and processed in Lightroom. I wanted the photo to appear aged and used a couple of onOne presets to mute some of the blue. Camera & Settings for Heceta Head Lighthouse: Nikon D5100, Nikon 70-300mm lens at 70mm, 1/125th, f/16, ISO 100. Show in RAW and processed in Lightroom. My SmugMug site with many other pics and my portfolio -- you can buy very affordable prints there! And me on Twitter although no one ever follows me. Blog archives can be seen by clicking on that black box at far right; I can't figure out how to make it easier to see, thanks to the techidiots at Google. Recent posts you may dig: Oregon ducks, the wild south Oregon coast and wild rose, desaturated.